"I'm Irish" my Mother always said. "Where in Ireland did they come from" I always asked. "I don't know" my Mother always replied. I have since discovered that this is a very common conversation between the generations. The more I delved into the History of the Irish in Canada and specifically my family the more I realized that our ancestors had a reason to put the Ireland they loved behind them. Unfortunately, for those of us who have some kind of Irish bug in our DNA that just won't let the past be buried, they covered their tracks too well. As I uncovered the generations of my Grandmother's maternal ancestors in Nova Scotia, I just found Counties and rumors, crumbs but no cookies. It has taken 10 years and I have now got back 250 years in Canada for all of my Nova Scotia lines revealing that they left Ireland sometime between the 1745 famine and the 1798 rebellion against the English. Back then the records in Nova Scotia were few and far between but I always wondered why there was never any family lore of where in the counties they were from. A town a village or even a crossroads not even a hint has come to light. One of the first PBS 'Faces of America' episodes was with Stephen Colbert and his mostly Irish Family History. 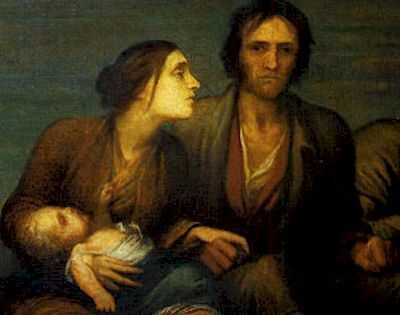 It explained the English business of creating the famine and then profiting from the subsequent business of the removal of the Irish to America. One scene really struck a chord and explained the mystery for me of the elusiveness of my Irish Ancestors. I chose to put this episode on Our Youtube Channel IrishFamilyHistory because of this scene. At the end of Part 2 Stephen reads his ancestor's oath of allegiance to America when he became a citizen. "I..do solemnly swear that I do absolutely and entirely renounce all allegiance to any foreign potentate, prince, state or sovereignty whatsoever and particularly to the Queen of Great Britain and Ireland." I realized at the same moment Stephen did that emotions we now have of Ireland are not the same as our Ancestors when they either chose to or were forced to leave. I can imagine their love of Ireland had become bittersweet, good memories replaced with images of so much pain and suffering. Putting it all out of their minds by not talking about it was probably the only way to move forward with any hope for a better future. NOTES ON THIS BLOGGER: Alannah Ryane wrote, shot, narrated and edited her own genealogy series "By Her Roots" for for Renowned Genealogist/Author/Producer Megan Smolenyak's Rootstelevision.com who also awarded her a small grant to produce her series. This series can now be seen on her YouTube Channel. Thanks Dr. Bill very happy to be part of the family indeed!